The idea of “two subjects” in one photo boggled me a little in just figuring out what it meant. 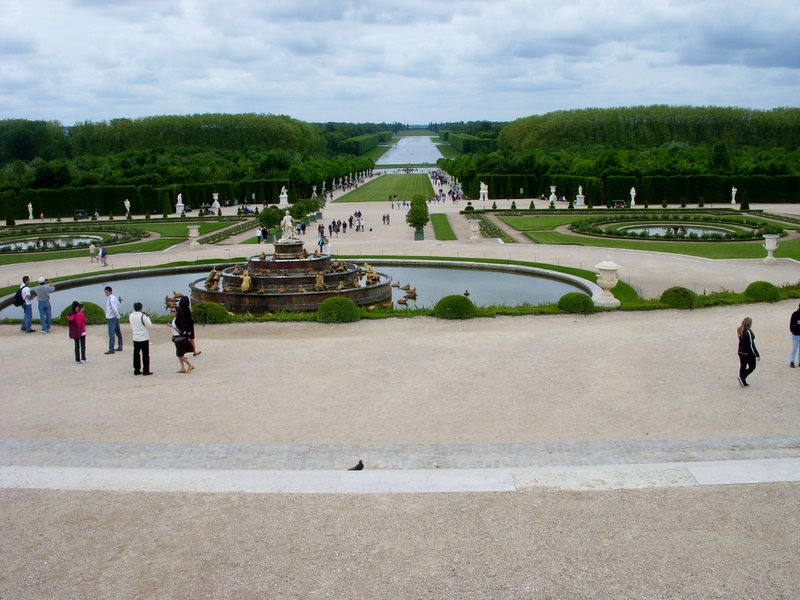 And I still don’t exactly know, but maybe this shot from a window at Versailles, France, might do. I wanted to capture the very old, wavy glass and the rose gardens outside. 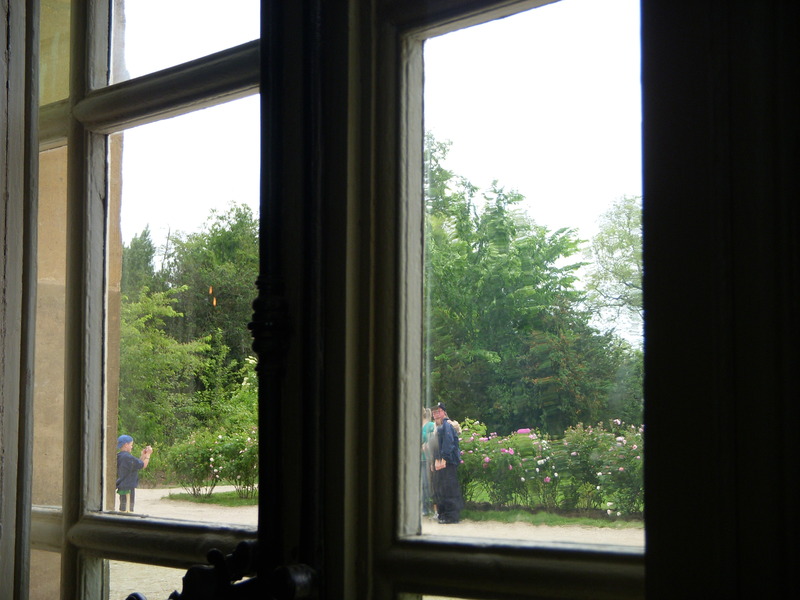 But what I captured in taking the photo was the wavy glass in an old french window with a scene beyond of someone else taking a photo of a couple standing in front of the rose bushes. I guess that might qualify as a two subject photo! So the second down I’ve chosen is down the road. I seem to take a lot of down the road shots: I have a whole series from our trip to California last summer, for example; I have more down the road shots from up on the farm. Country dirt roads are the perfect place for down the road shots. The two I’ve decided to post are from travels, too. The first one below is from Hawaii. 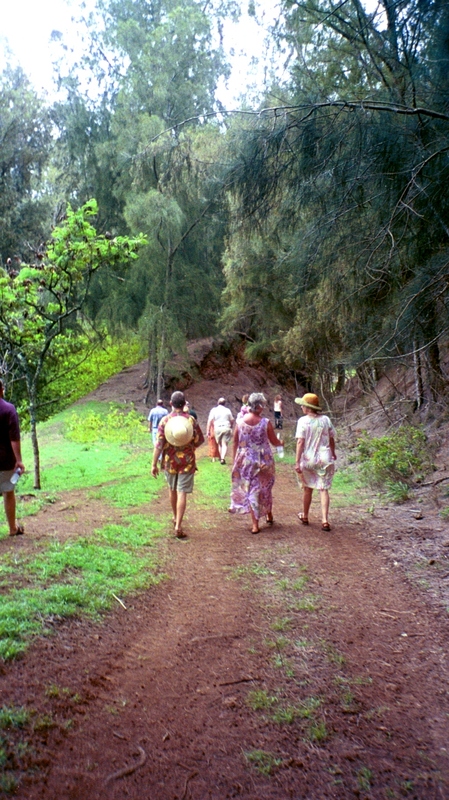 Several years ago, we held a family reunion in Hawaii where my sister Jeanne lives and while we were there, participated in a land blessing. Jeanne and Robert had finally finished clearing acres of tangled brush and were getting ready to build a retreat center. This shot is walking down the trail to the gulch where the mother stone sits. If you’ve been to my sister’s web site, www.hawaiiislandretreat.com, you know the place looks remarkably different now (and if you haven’t looked at her website, do! It’s a fabulous boutique hotel.). This second shot–well, you could say it’s a lot like Hawaii Island Retreat if you’ve looked at the web site. Only not. But sorta. The same sort of fabulous main building. This shot is looking from the steps of Versailles down the path between hedges (down the path is sort of like walking down the road–at least in theory). Our glorious trip to France. Too many stories and too many photos, but this particular day, we walked down these steps toward the pigeon below, on down to the level of the fountain and around it, down to the little restaurant you can’t see at the end of the grassy patch and before the water, and turned right to walk down to Marie Antoinette’s summer-house. Between Los Angeles in the far west and Kansas City in the center of the country, there’s one of the oddest cities I’ve ever visited: Las Vegas. I’ve never been one to long for the bright lights of Vegas or even for wildly crazy nights. Perhaps because my life, itself, has been wildly crazy enough without adding clanging slot machines. 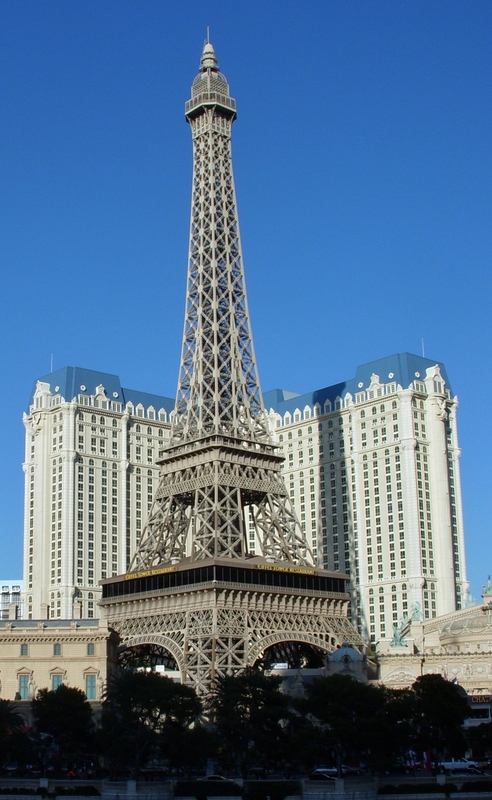 Las Vegas is the most between place I’ve ever seen and the Eiffel Tower reproduction, between the wings of a hotel, even more betweener – between reality and fantasy, between hotel wings, between two cultures, between one side of a desert and another. 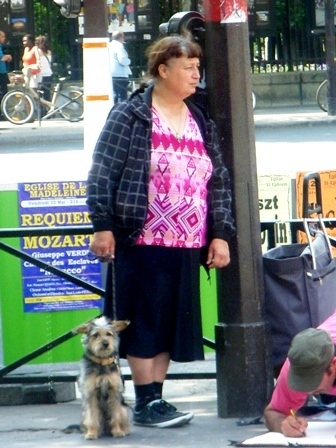 This is one of my all-time favorite photos of our Paris trip which I shot from an open McDonald’s door, of all places. We had walked and walked and walked, and then finally walked more through the Luxembourg Gardens, which you can see in the background. As we exited, Cliff saw the McDonald’s across the street. And so the juxtaposition of sitting in McDonald’s with hamburgers and cokes and this woman outside leaning against the light pole was too good to pass up. Even the dog is waiting as the man finished his drawing. This is a photo of Grandma Sunderland and her family. Not this Grandma Sunderland, as in me, but rather my father’s mother. Funny thing is, the older cousins all say I look like her. And once, I wrote an essay called “I’m My Own Grandma” which tells the story of me at my sister’s house, making biscuits, shortly after my grandson was born. I wasn’t quite used to being a grandmother yet but I did remember my Grandma Sunderland and her high fluffy biscuits. My sister is the one who, as I pulled them from the oven, the biscuits not the children, said, “You’re Grandma Sunderland!” I, who kept my family name through all my moves and changes. 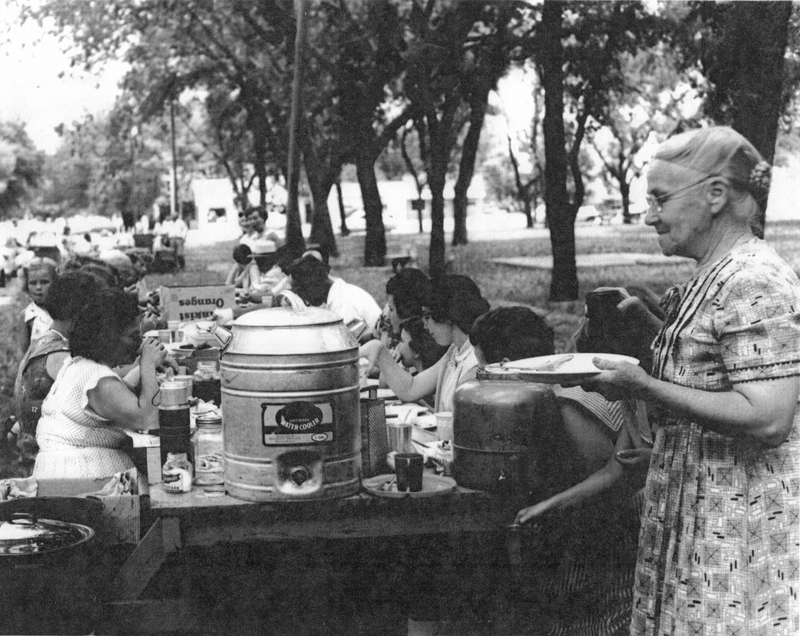 So here’s the real Grandma Sunderland, standing at the end of a table full of children, her children, her children’s children, and food, and smiling. Circa mid-to late-1950s. She looks pleased. As would I be, and am, when my family gathers.